The door. . . . .
See this door? It is a steel, triple-locked, standard door required for a “safe room” which meets government codes to provide a refuge during tornadoes. 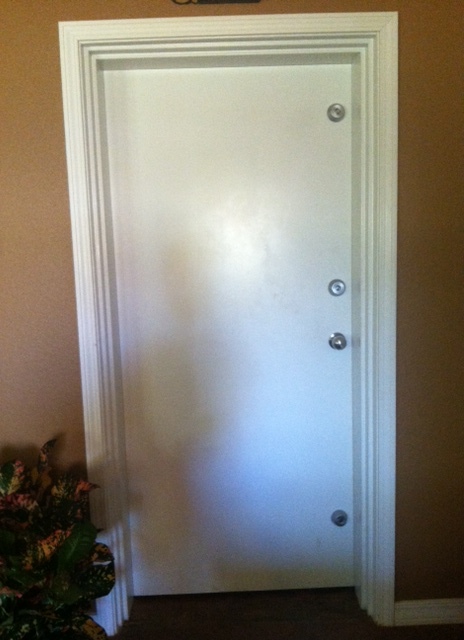 It is also the door to our home office and gun safe. The floor, ceiling, and walls of this room are all concrete. Living in Arkansas, a part of “tornado alley”, the construction of this room when we built our home seemed wise. It does provide a sense of security when the weather radio sounds or all local TV programming is preempted with blow-by-blow (no pun intended) descriptions of the paths of dangerous storms approaching our area. However, I need to use the door as an illustration. I have posted infrequently on this site for the past several months. My most recent post was on August 31, just days after my son committed suicide. Ironically, the post that preceded it (posted in July), referenced a conversation with him in which he was reminding me of my neglect of this blog. I wish it had been a longer conversation. The experts call this feeling I have survivors’ guilt. I just call it regret–regret that I lost him before I lost him. His illness and addiction effectively divorced him from his family, locking him away as securely as the safe room door. But, there’s more to the door analogy. Because I go through each day–working, cooking, going to church, doing laundry, attending our grandson’s football games, being “social”–doing all these things with the door to my denial and anger and grief securely shut and locked. I think. Yet, at the most odd and inopportune times, that door swings spontaneously open, and my mind is filled with the last images of Daniel. A silent scream of disbelief echoes through my head. My heart fills to bursting with the ache of his absence and the effort of drawing in breath is magnified a hundred times. My body is suddenly crushed by the weight of this loss. And a cloud of sadness envelops me. Sometimes I am able to cry. Sometimes I am simply overwhelmed and sit in a daze wondering how I got to this place in life. But always, eventually, I, piece by piece, bury those images, silence that scream, tell my heart to keep beating, breathe deeply, and drag my heavy self with its cloud of sadness surrounding me (think Pigpen’s cloud of dirt in a Peanuts’ comic), to that sturdy door with it’s triple dead-bolt locks. I shove all that denial and anger and guilt and grief inside and click by click by click lock all those locks, lean against the secured door, and pray that someday it will remain closed, knowing full well that it won’t. In truth, I wouldn’t want it to. Because somehow I know that repeating this process is a part of healing the hole in my heart. A card I received observed that I have “a hole in my heart that cannot be fixed by any cardiologist or thoracic surgeon”. I treasure that card because it so perfectly describes the loss that I feel. I now am the mother of two living children and one deceased child. The remnants of the place where Daniel lived will always be there, but, by the grace of God, I know that it will someday bleed less, hurt less, and, ultimately, scar over, so that I can once again not fight with the door. Previous postWords of hope. . .
Kathy, as I read this it brought back memories of when we lost Dwain, even though it was different circumstances the pain I think would be comparable. With time and by GODS grace the wounds do scab over but sometimes they get bumped and the bleeding starts fresh. But we both know our precious Lord and Savior will get us through this. Please remember I’m only a call away. Sue, I know you are one of the many who can understand the pain of losing one’s child. I always knew it must be the worst kind of loss. Now I can truly understand. You have survived, which gives me hope that I will, too. Love you!